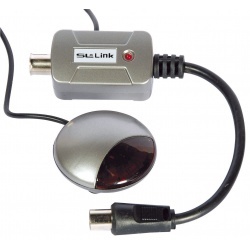 The SLX Link works by picking up the remote control signal from your Sky remote in your bedroom via the little eye, converting the infra red pulses to electronic pulses, sending the electronic pulses down the cable to the Sky receiver. SLXLINK system is the easy way to distribute high quality digital pictures plus normal off air channels, the tvLINK function built within the Sky digital receiver to control the digital receiver from a different room. It operates between the RF2 output on a satellite receiver (from which it receives the 9Vdc it needs to power it) and an additional TV. 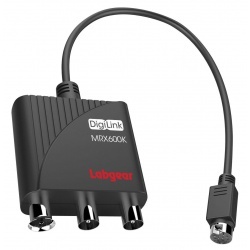 Allows you to connect a Sky HD box (that doesn't have a RF2 outpout) to a coaxial cable distribution set up. So you can send the output from your Sky box to other rooms in the home. You can also control the Sky box from those rooms using a magic eye, as the MRX600K will also power any eyes connected. Allows the use of existing RF Link devices used to distribute Sky signals and control remotely Sky receivers. Power supply Output 12V1000mA max. Programmed with UK free to air channel list. Perfect box to connect to a dish for Astra 28.2e and get all the UK free to air stations. Also features a CA slot for foreign subscription cards (make sure to check compatability). External power supply suitable for caravans. Suports list of programmes,have four sort function:FTA>CAS,satellite,transponder, alphabet. Teletext output through VBI and OSD. Supports setting timer, you can add up 20 event timers at most. Media play: Supported avi, mkv, ts, tp, trp, mpg, mp4. Record and playback stream files:Recording current channel. (FTA or scramble). Dolby Digital (AC-3) with bit rates up to 640 Kbits/s,LPCM up to 48 KHz,MP3.